The keeper of the keys of a fortress would most often be the King's deputy left in charge of the garrison. The keys were worn as a status symbol, showing the importance of the bearer. 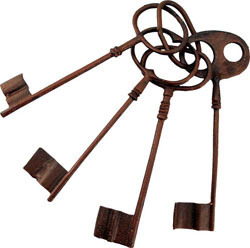 This set of 4 large rustic keys arrive on a large rustic key ring. Each key measures 10" long!